Entries close at 6 pm on Wednesday 1st May. The draw will be published on 3rd May: HERE. Latest News: The event is running as planned. 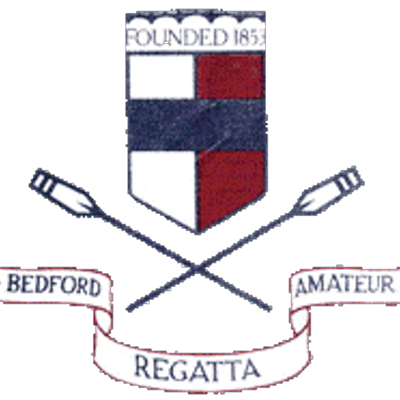 Bedford Amateur Regatta founded in 1853 brings competitive rowing to the picturesque River Great Ouse in Bedford maintaining its position as one of the largest single day river regatta in the country. Racing takes place through the heart of the town over a 1,200 metre course with races every two minutes and competitors coming from far and wide representing Schools, Colleges and Clubs. Events are offered for fours and eights across all categories from J14 upwards including Novice and Elite. Organised by a Committee with representation from all the rowing clubs in the Town, the event continues to be one of the key social events in the Town’s calendar with parents, supporters and competitors enjoying the atmosphere of the Regatta enclosure close to the Suspension Bridge. Over the years the event has played host to many of the country’s up and coming top rowing athletes with many going on to win Olympic and World Championship medals. We hope that however you are involved with the Regatta you have an enjoyable and successful experience.